Completely mad!.....The effects of mercury compounds in 19th century hat making are well documented...mercury poisoning is still known today as 'Mad Hatter's Disease'. I've been told mercury exposure can cause aggressiveness, mood swings, and anti-social behavior. Oh, really? 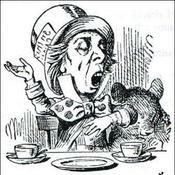 The Hatter has never shown any indication of aggressiveness or mood swings! Now that I've introduced myself, let me assure you you'll find my wanderings through the world of flea makets, thrift shops and the like will lead you to vintage glass and kitchenware, some collectibles, some home furnishings, and occasionally, the whimsical.....as I like to say, a varied and eclectic mix of fun and interesting stuff!.....No, youâ€™ll not find my wares at Wal-Mart or Costco! So enjoy yourself.....browse through The Hatter's Booth.....there just might be something you really don't need but simply can't resist! MadHatter2 doesn't have any items in their booth! He’s a down-to-earth person you can trust! A very honest and ethical person and seller! Can’t go wrong with Hatter! !